Al Silverstein found himself in awe in 1988 playing for former major leaguer Richie Hebner at single-A Myrtle Beach, according to The Pittsburgh Press. That's because the Staten Island-native recalled Hebner's one season played in Queens, The Press wrote. "He played for the Mets and I was always a Mets fan," Silverstein told The Press. "You would grow up and see the guy on television and next thing you know you're playing for him." Silverstein went on to play in four professional seasons, but never got to play on television in the majors himself. He made it to high-A, but didn't make it higher. Silverstein's career began in 1987, taken by the Blue Jays in the 31st round of the draft out of the New York Institute of Technology. At the New York Institute of Technology, Silverstein won league all-star honors in 1985 and the school scholar-athlete award in 1987. In 1983, he pitched NYIT to a 2-1 victory in the conference playoffs championship game. Silverstein started with the Blue Jays at short-season St. Catherines. He went 3-3 over 22 outings, two starts, with a 1.94 ERA. He also saved four games. He moved to Myrtle Beach and Hebner for 1988. He went 7-7 that year, with a 3.55 ERA, then played at high-A Dunedin for 1989. 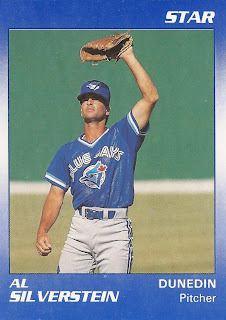 Silverstein got into 28 games at Dunedin in 1989, then 45 there in 1990. He went two scoreless in an April game, then picked up a relief win in May with 1.2 innings of scoreless work. Overall, he went 7-5, with a 2.26 ERA on the year, his final season as a pro.